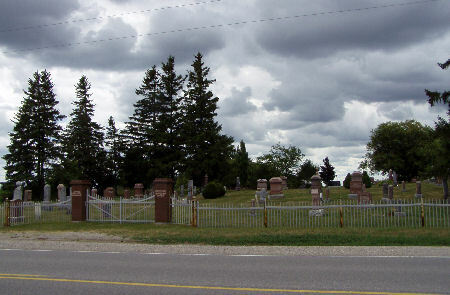 Rea Cemetery is located at the north east end of Eramosa Township, Wellington County, Ontario at Concession 7, Lot 29. The cemetery gates were erected by Edward W. Oustic in 1958. GRANT, James and Euphemia REA. George Phin GRANT. OUSTIC, George and Elizabeth WELLS. George OUSTIC and Clarissa Freure. Edward W. OUSTIC. Claude V. OUSTIC. SCOTT, John and Sarah A. HUDSON. Robert E. SCOTT. TORRANCE, William and Euphemia Weatherstone. Henry TORRANCE and Jane LOWRY.